1. Preheat the oven to 180c. In the bowl of a stand mixer add the eggs and sugar and mix at high speed for 5 minutes until they have become thick. 2. Then sift in the flour and cocoa powder and gently fold in. Then pour onto two lined Swiss roll tins and gently tip trays to spread the batter. bake for 10 to 12 minutes then let cool for two minutes before turning out onto two damp tea towels and peeling off the baking paper. Roll up into a log and let cool. 3. Make ganache by melted the chocolate with the cream in a bowl over a pan of boiling water then mix and let cool a little before chilling in the fridge. 4. Make filling mix the chestnut puree, sugars and mascarpone then add the cream and whisk until thick. 5.Once the sponge has cooled unroll it and place the two sponges in a landscape position, spread the filling all over and smooth out then cut off a strip about 4 inches wide from the top of both. Roll one up then roll the second one around that one and place on a cake stand facing up like a trunk then add the two strips one above the over around cake. 6. To make the top part lighter like the inside of a chopped tree truck I whisked 100ml cream, 3 tbsp. brown sugar until thick then I added two tbsp. of the chocolate ganache. 7. Spread this on the top and use the back of a spoon to make rings. Then spread on the ganache around the edge and smooth up. 8. 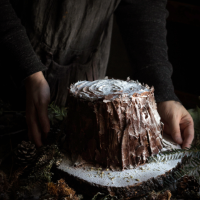 Melt 60g chocolate and spread onto a sheet of baking paper and let cool just enough to score it and roll it up, once set break into bark like bits and add around the edge of the cake. Dish with cocoa powder and icing sugar.